My name is Rebecca Weaver and I survived making a microbudget indie feature. I made a film (wrote/directed/produced/starred in/edited) called June Falling Down for an $11K production budget with my boyfriend Chris and I as the primary crew. My mom did craft services, we filmed in her house, friends acted for beer and snacks, volunteers or a mic stand held the boom, you get the picture. So this awkward question comes up sometimes when talking to other filmmakers about why on earth you’d make something so small. Why not wait until you have more money or resources, heck, even a producer? (which we totally did not – it was seriously just Chris and me and Google.) Why not wait until you could make something bigger that goes to Sundance or whatever? And it’s true. We could have waited until the stars aligned and we found just the right producers/investors/ name actors/etc. But that community wasn’t coming fast. Chris was a pilot/bluegrass musician and I was an actress/writer/house cleaner. We only had ourselves. The truth is, it would have taken years to find the right people (considering our severe lack of money) and I would have aged out of the part I’d written for myself. And my dream location (my family’s farmhouse) being torn down. Not to mention I had a gut feeling we could pull it off. So we made our movie before we were ready. We weren’t dreaming of a runaway festival hit or superstardom (though those fantasies helped sometimes). We anticipated zero financial success. Now, I don’t recommend all filmmakers do this. It was so hard, it took so long, and at times it was really damn lonely carrying this film on our backs, especially in post. But I wasn’t willing to wait on my dream for a second longer. So we just made it happen. We gathered friends to act and found free locations in the small towns in Door County, Wisconsin where we filmed. Business owners made us soup or drank beer with us while we filmed (yes, we’re drinking real beer in the movie – did I mentioned we all did this for free?). We had 50 local extras come out to our wedding reception scene and dance to a band and eat Costco wedding cake. We didn’t know how we were going to pull it off, but just by telling others about our plans (mostly on Facebook), community jumped in to help. Simply by starting our movie, community joined up with us. An awesome part of being so indie is the freedom that comes with that level of independence. Because we had no investors (we did crowdfunding and credit cards), we could do whatever we wanted. And, because we were so tiny, I had no choice but to have my hands on every aspect of June. I wrote, directed, etc. but I also I fixed room tones and did additional color correction. I designed our credits, ran our social media. The film is already majorly autobiographical in that it’s about losing my dad to cancer intertwined with a romantic comedy, but because I’m all over it, it’s a painfully “me” movie. It’s my dumb humor, it’s my experience of grief, it’s my joy over little awkward moments. I chose every actor, every prop, every song. To state the obvious, June Falling Down is wildly self-indulgent. And oh my goodness, it was fun and I know it won’t always be this way, but what a way to introduce ourselves to the world. I was completely myself with this movie (for better or worse). It’s a thrilling, not to mention raw, experience. But in the end, it means that I got a shortcut to finding my exact audience that might like my next films. We don’t talk enough about how much of getting started in filmmaking is a long game. It’s not a popular topic but it’s always on my mind. I loved the idea of breaking out immediately, but I had a feeling that I’m really more of a slow burn kind of person, and I have faith that over time, I’m finding my people. By being completely myself, community followed and supported us. That means that also, naturally, that filmmakers with similar taste have also connected with us. Look, not everyone likes (or is even open to) quiet movies that are so homemade they’re charming. Not everyone likes movies with a lot of ache and quirky humor in them. But those that do? Look out, because we need to be friends. How painful is it to network with people who are just the wrong fit? Not that it’s a bad thing, but when you find those diamonds that like what you like, that got into filmmaking for similar reasons to you – there’s no better feeling. 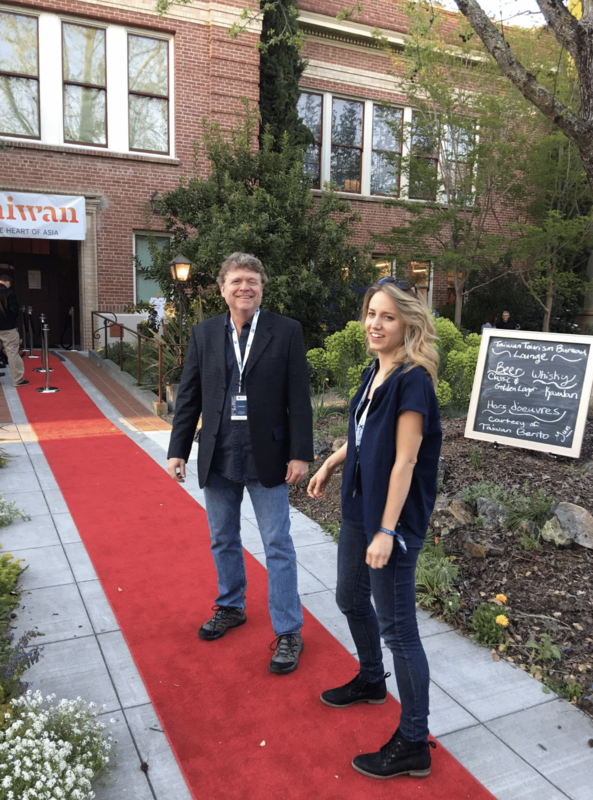 To go to festivals and meet filmmakers that connected with our work and want to go in a similar direction…. honestly, that’s all we ever wanted. And something else that’s really cool and not talked about? Fellow feature filmmakers are the best. We know what we’ve all been through just to get to the screening. Whatever flaws our films have and they almost all do, we’ve been through the fire and that experience bonds you. By putting our work out there, community came to us. To make your movie, flaws and all, to make your taste your calling card, to fully express yourself, to plant your flag – there’s nothing like it. But from the point of view of community, I can’t recommend it enough. Rebecca Weaver is a writer-director-actor based in Los Angeles. Her first feature, June Falling Down, recently released to iTunes after completing its 15 festival run. It won Best Independent Feature at Sonoma International Film Festival as well as Best Feature at Lone Star, Knoxville, and East Lansing Film Festivals. Latest acting credits include the horror feature Baphomet and the upcoming 80s thriller Night Run. She is currently doing rewrites on scripts and working on her next feature.